Who writes international climate change reports? This week in the journal Nature Climate Change, colleagues and I published an analysis of who has participated in the latest 5AR mitigation report from the Intergovernmental Panel on Climate Change (IPCC). We analyse North-South representation, institutional pathways, co-authorship patterns and disciplinary backgrounds, using Social Network Analysis of authors’ CVs. The US and UK are the countries where most participating authors got their training – although they are formally listed as representing a more diverse set of countries. Have oil companies learned from the Niger Delta crisis? In this Q&A from The Conversation, Celeste Hicks, former BBC journalist and author of ‘Africa’s New Oil: Power, Pipelines and Future Fortunes’, shares her insights into the impacts and outcomes of oil finds for Africa’s rural communities. The interview was conducted by IDS research fellow Jeremy Lind, who introduces the piece. Over the past decade, oil and gas exploration operations have multiplied across sub-Saharan Africa, often in remote areas far from political and commercial capitals. Wooed by surging prices in global markets, at least 90% of African countries now explore for oil and gas. Until recently, when oil and gas prices remained high, foreign investors were willing to accept the risk on establishing operations in areas where there was little infrastructure and, sometimes, local opposition and resistance to states’ efforts to develop resources. 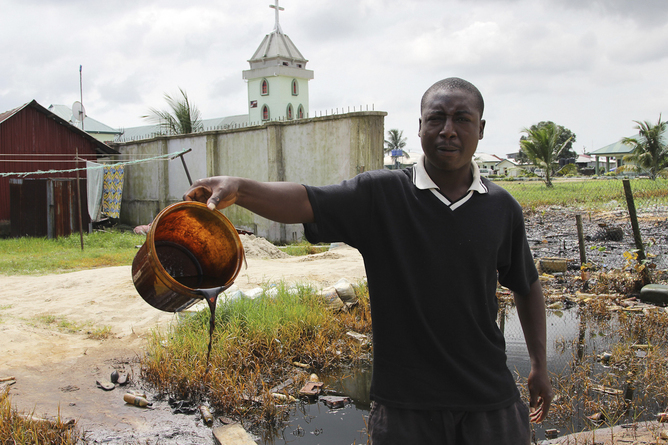 A villager shows a bucket of of crude oil spill at the banks of a river, after a Shell pipeline leaked, in the Oloma community in Nigeria’s delta region November 27, 2014. Invariably, African governments trumpet the potential of oil and gas finds to transform economies and improve lives and livelihoods. But the economic, social and security benefits of oil and gas operations for rural populations are unclear. Why is this important? As resources become more contested and incorporated as part of a globalised economy, politics take on a new form. We have seen this in the land, water and green grabbing debates, which provide the backdrop to the conference. The resource grabbing debates have each raised important issues around who gains from what resources, and how resources are constructed, regulated and shared, as we discuss in our ‘narratives of scarcity’ paper that will be presented at the conference. Also at the conference, we will be debating the much talked about concept of the Anthropecene, and the notion of ‘planetary boundaries’, with Johan Rockstrom and Melissa Leach taking the stage to present their perspectives. These ideas have put the politics of resources at the centre of the debate, and the controversy generated has not been seen since the discussions around the Club of Rome’s Limits to Growth report. After the Resource Politics conference closes, we are delighted to announce two additional events on Thursday 10 and Friday 11 September, both taking place on the Sussex University campus. Both workshops feature contributions from Prof Dianne Rocheleau (Clark University) and Kathleen McAfee (San Francisco State University). This workshop includes lunch. Please register by email to A.Brock@sussex.ac.uk by 8 September. Organised by the Centre for Global Political Economy (CGPE) and the STEPS Centre. 1-2.30pm, Convening Space, Institute of Development Studies. No registration required. Our Storify tells the story of the conference through tweets, images and links posted throughout the event. It will be updated as the conference progresses. You can view the feed at Storify.com. Green economy and the ‘growth fetish’: what are the alternatives? Many advocates of ‘green economy’ thinking endorse carbon-offset trading and other markets in nature both to foster conservation and to stimulate economic growth. Some green economists, sensitive to ‘underdevelopment’ and the asymmetric causes and effects of climate change, emphasize the environmental costs of poverty and inequality but are no less wedded to the goal of growth. Why this fixation on growth? Are there alternatives? Growth is a core requirement in conventional green economics because sustainability would otherwise entail the sacrifice of ‘development’ and because growth is the context in which private investments in greening can be profitable. This page links to all the materials we’ve made available from the Resource Politics conference on 7-9 September 2015. A selection of conference papers are already available to download, with more to follow soon. Video from the conference plenaries (including Betsy Hartmann, Rohan D’Souza, Michael Watts, Johan Rockström and Melissa Leach, and a panel on social justice) and interviews with participants. Our conference Storify tells the story of the conference as it unfolded, including words and images taken from participants’ contributions on the Twitter hashtag #resourcepol. The illustrator Raquel Durán created a series of large pictures during our four plenary sessions, providing a visual record of the discussion. View a set of photos from the conference, taken by Lance Bellers. We asked conference participants to tell us where, how and with whom they ‘engaged’ in their research and/or activism around resource politics. We got plenty of contributions to our world map, which we’ve turned into an online version. Conference participants will receive updates when these are posted: if you didn’t attend, you can sign up to the STEPS newsletter for updates. The international conference Resource Politics: transforming pathways to sustainability was held at the Institute of Development Studies from 7-9 September 2015. View the conference programme. 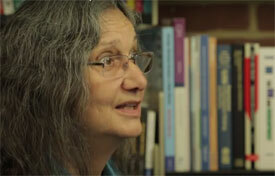 The event is the latest conference in a series from the ESRC STEPS Centre. 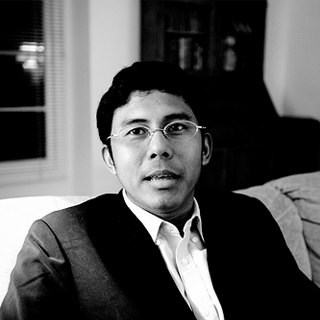 Myint Zaw, winner of one of this year’s ‘Green Nobels’, the Goldman Environmental Prize for Asia, will speak at Resource Politics 2015. Journalist and social activist Zaw launched a national movement that successfully stopped construction of the hydroelectric Myitsone Dam on Myanmar’s treasured Irrawaddy River, despite heavy government scrutiny and restricted use of tools like email or social media. Watch a video about his work (on YouTube).